Are you tired of seeing me utilizing slow cooker once again? I was discussing this cooking method with my Mama last weekend, and she was surprised that the finished dishes tuned out so flavorful, since both her and I had the misconception that using Crock Pot would dilute the finished broth… Maybe I talked my Mama into using this time saver for her household from now on..
Lay the beef pieces on the bottom of the slow cooker, toss in garlic and ginger, then onion chunks, add in the rest of the ingredients, then stir to mix well. Lay the cabbage leaves on top of everything, cover, then cook on high for 4-5 hours. 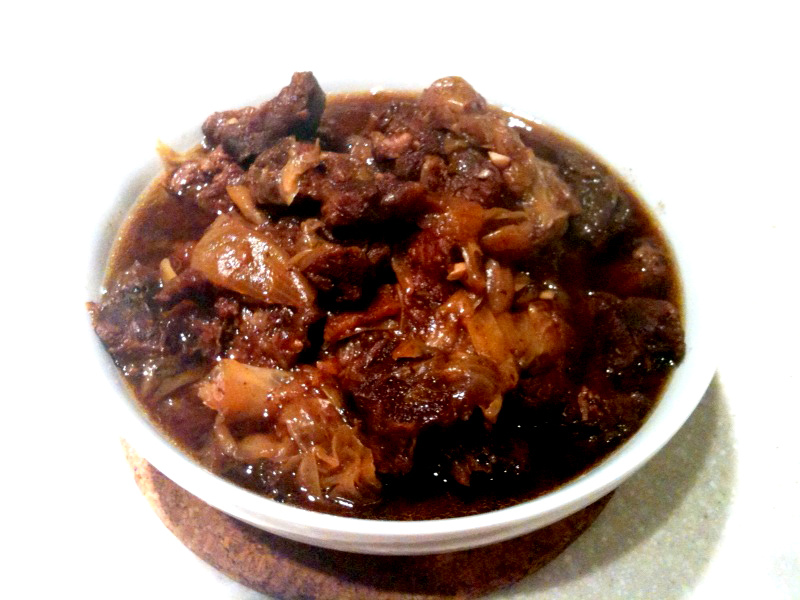 You know I cooked a new beef stew last night (my Mom’s recipe), the flavor was good but the meat could be more tender. Haven’t had a lot of luck with braised dishes lately, I assume it’s either because I didn’t cook the meat long enough, or the meat quality wasn’t as good… Kinda disappointing.